San Francisco, CA & Dublin, Ireland; Monday 2nd February 2015: January saw Yahoo further increase the gain it made in US search share last month, according to the latest data from independent website analytics provider, StatCounter. Google fell below 75% in the US for the first time since StatCounter Global Stats began recording data*. StatCounter Global Stats reports that in January, Google took 74.8% of US search referrals followed by Bing on 12.4% and Yahoo on 10.9%, its highest US search share for over five years. "Some analysts expected Yahoo to fall in January as a result of Firefox users switching back to Google. 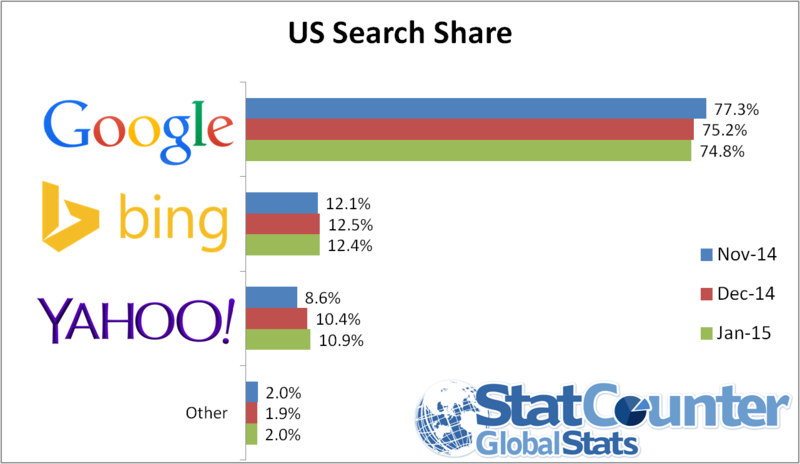 In fact Yahoo has increased US search share by half a percentage point," commented Aodhan Cullen, CEO, StatCounter. "It will be fascinating to see if these gains continue." StatCounter has also run a special report on US search engine usage by Firefox users only. 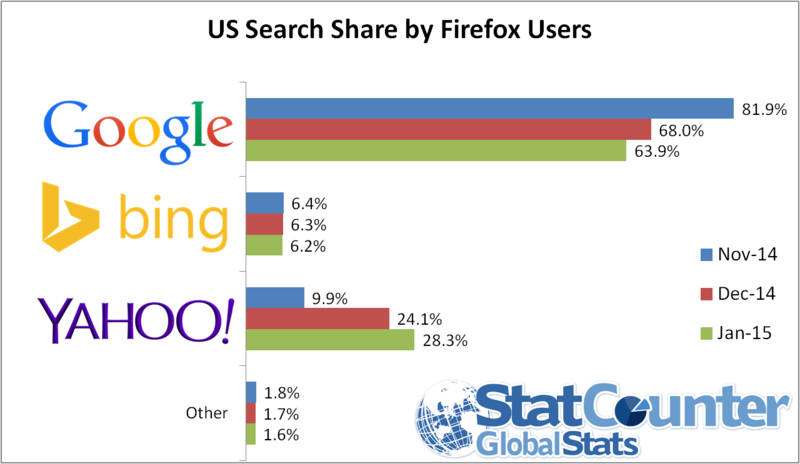 Yahoo-on-Firefox usage in the US increased from 9.9% in November 2014 to 28.3% in January. Over the same period Google-on-Firefox usage in the US fell from 81.9% to 63.9%. 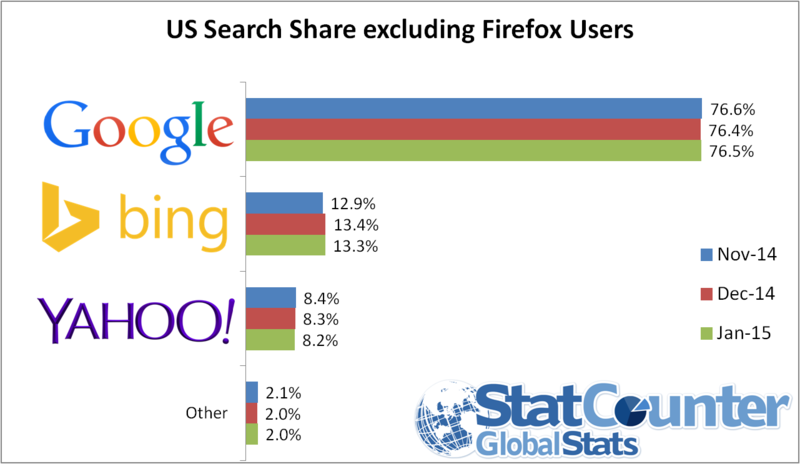 StatCounter says that it is only Firefox users responsible for the change in US search share. "When we removed Firefox usage from the US search data, Yahoo's gains and Google's losses were erased," commented Aodhan Cullen. "This highlights the importance of the default search option and the significance of the upcoming Safari search deal for the major players." Firefox users generated 14% of US internet usage in January according to StatCounter, whose main business is to provide independent website analytics, including a free option. StatCounter (www.statcounter.com) members include companies, agencies, bloggers, self-employed, charities and those who want to measure activity on their website, blog or forum. Key features include ease of use, independence and ability to view individual visitors in real time. * StatCounter Global Stats began tracking global search statistics in July 2008.